Kevin Harvick currently competes full-time in the Monster Energy NASCAR Cup Series, driving the No. 4 Ford Fusion for Stewart-Haas Racing and part-time in the Xfinity Series, driving the No. 98 Ford Mustang for SHR. Harvick holds the all-time record for Cup Series wins at Phoenix International Raceway with eight wins. Harvick is also the third winningest driver in Xfinity Series history with 46 wins. 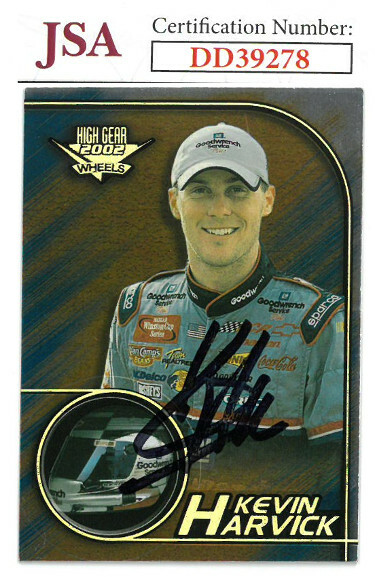 Kevin Harvick has hand signed this 2002 Wheels High Gear Racing Trading Card #F9. JSA Hologram #DD39278 and Certificate of Authenticity.